Kids will love learning with the Musical Rainbow Tea Party! The lovable light-up teapot bubbles with personality while percolating "tea," and teaches kids about colors, matching, manners and counting, too! Kids will love matching and building motor skills as they play. Host a special tea time for two to learn lessons in sharing. 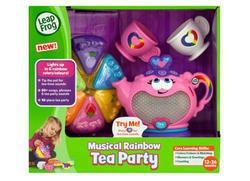 And, best of all, the Musical Rainbow Tea Party features 50+ songs, phrases and tea party sounds!
? 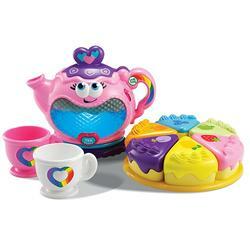 Musical Rainbow Tea Party is a 10-piece set that lights up in six colors and features songs and surprises!
? Tip the teapot to see it light up, hear fun sounds and see the "tea" move realistically!
? Teaches colors & matching, manners & greetings and counting. Recommended Age : From 1 To 3 Years Old.